Patent notice filed in 1922 by Norman C. Winkler, homesteader in Romero Canyon. Homesteaders had five years to "prove up" their claims with a dwelling and crops or livestock. Winkler filed on the property in 1920, built a cabin in 1921, planted trees and raised chickens. 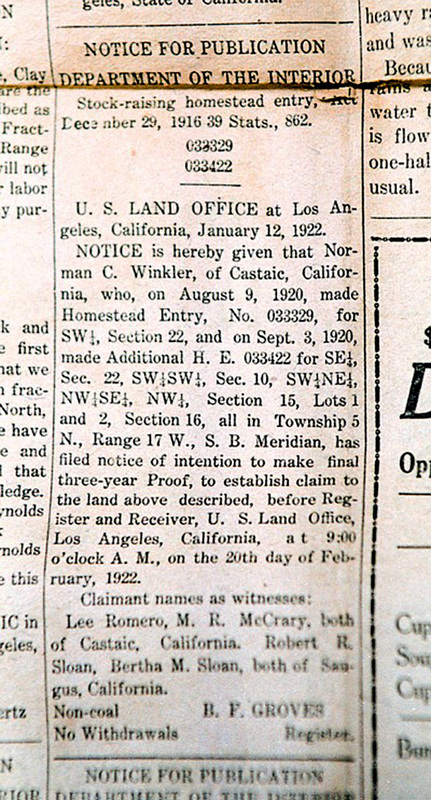 By this notice Winkler was saying he would complete all of the homestead requirements within another three years (1925). The patent filing was witnessed by some of Castaic's prominent early citizens, namely Lee Romero and Robert Sloan. The notice ran in The Newhall Signal on Jan. 12, 1922. SG0923f: 9600 dpi jpeg from 200 dpi tiff | Collection of Marylynn Butters.